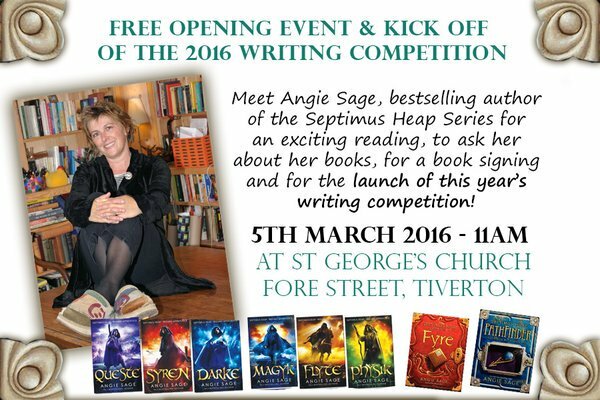 On the 5th March, in the Devonshire town of Tiverton, myself and my fellow festival organisers will be welcoming in this year’s Literary Festival with the help of the brilliant, Angie Sage. Although the main festival doesn’t start until 8th June (running until 12th June), we are kicking off proceedings on 5th March with our annual short story competition! Why not come along to St George’s Church on 5th at 11am to meet Angie, hear how to enter, and discover what this year’s competition theme is! Last year the standard of entries was very high. I judged them alone- and it was a tough assignment! This year Angie is helping me with the selection process- I can’t wait to see what you can all come up with! You don’t need to attend the launch to take part, nor do you need to live locally. This competition is open to everyone. If you are unable to attend Angie’s launch, I will let you know what the story theme is- and all the rules- on the 6th March. In the meantime, I can tell you that there are age related categories for everyone from 4 years old to adult, the word limit is 400 words, and the closing date is 30th April.